This is one of the most unique engagement ring designs, set with a 1 carat equivalent 6.5mm cubic zirconia (CZ) center stone and crafted in 14k white gold. The band measures 3.2mm wide and is made to order and hand-set in a 4-prong setting, for the utmost in quality, using a high quality diamond simulated stone. 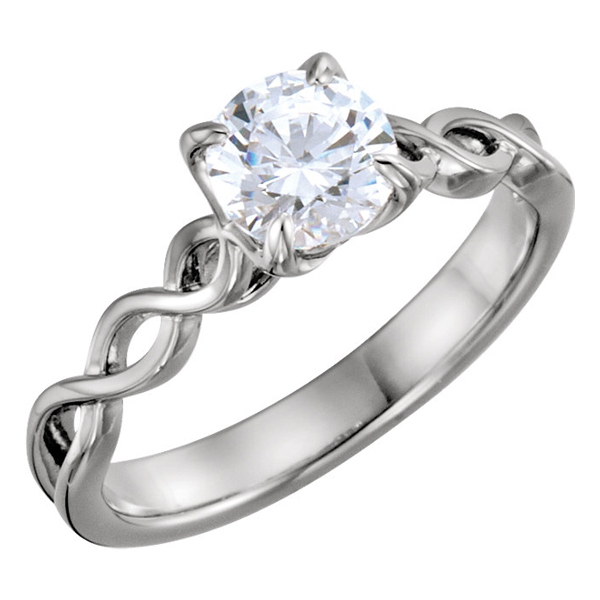 The infinity symbol design on the ring's band symbolizes your everlasting love in marriage. Would you like this ring with a real diamond? See below. Apples of Gold Jewelry guarantees the CZ Infinity Knot Engagement Ring to be of high quality and an authentic engagement ring with real diamonds, as described above.